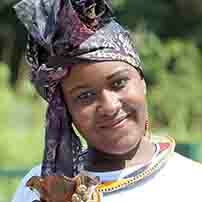 She is a human rights activist, public speaker, Business Consultant, FGM trainer/consultant/campaigner. Her passion to support girls and women has greatly been influenced by her own experience of living in poverty and experiencing discrimination at a younger age. She has fought for her education from a young age and learnt to fundraise and look for scholarships for herself since she was in secondary school in Kenya and later came to the UK for further studies. A part of her Maasai community still doesn’t value girl’s education. Valentine now has a diploma in Creative Writing & Documentary Film Making, Degree in Business Management and an MBA. For over 5 years, she has been involved in working with communities mainly girls, women and young people and has set up projects and campaigns in Africa and the UK to support these groups. She supports small women groups to set and start up their own business enterprises. She is a multi-award winner and her community work and has been recognised by different organisations including The British Council, Women Federation for World Peace International and National Institute of Adult Continuing Education among other organisations and bodies.